A knife of this quality and rarity is easily worth $695.00 on the collector’s market. One fortunate client can own this custom W.E. Little knife & scabbard for only $395.00. 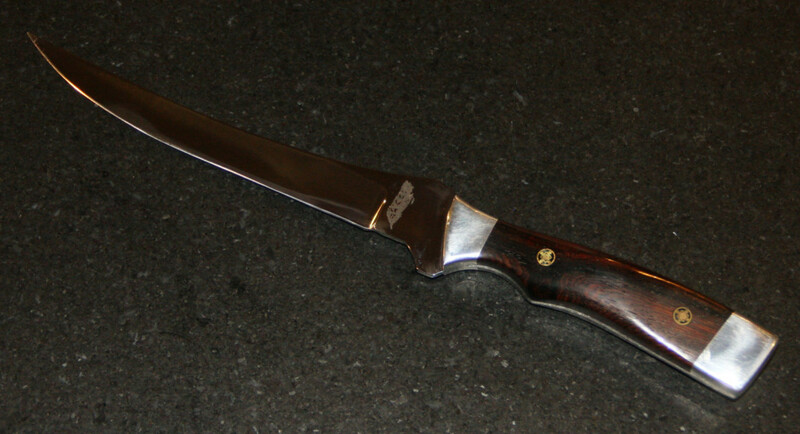 We have two of these knifes and this is the only one with this logo set up, and with cocobola scales. Truly unique. This knife features cocobola scales on the handle. The blade is finely tapered, thin, and flexible – just what you’d expect from a high-end fillet knife. The Little logo and GW logo are etched on opposite sides of the blade. The fit and finish is superb. If either of my boys had been a passionate angler, this would have made a great college graduation gift, but they’d rather have a vintage Gibson or a stack of classic vinyl records. Perhaps it will make the ideal gift for your son or daughter!